Our Dentists Are There For Family. 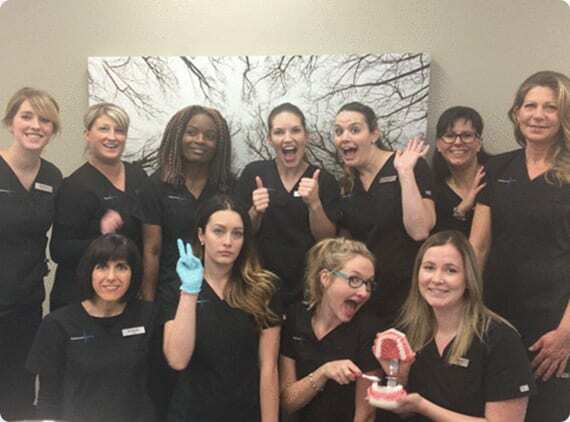 Extended hours, family appointments, and emergency care are all ways we are working to ensure families in Sherwood Park never go without proper dental care. Our goal is to provide dental procedures with care and precision. This includes emergencies, wisdom teeth extractions, root canals, crowns, bridges, cold sore removal, white fillings, dental sealants, implants, invisalign, and gum grafting. Extended HoursWe offer extended hours to help you find the time to take care of your teeth. Emergency DentistryEmergency? Call 780.464.4166 Do you have a toothache, chipped or broken teeth, lost filling, lost crown, broken braces, etc. Any injury to the teeth or gums can be potentially serious and should not be ignored. Family DentistryWorking with a family dentist makes it a lot easier for you to keep up with your family’s dental appointments and ensures that you only have to drive to a single location whenever it’s time for a checkup or cleaning. Looking for a dentist? We have been serving Sherwood Park for 40 years. Call 780.464.4166 to schedule an appointment. Or Book an Appointment Online. Learn about Your First Visit. We want to hear from you. Please call us at 780-464-4166 or send us an email to make your appointment. We look forward to helping you with all your dental needs and questions. We have built a practice over forty years serving the community of Sherwood Park. We care and listen to your wants, needs, and desires. We care for our emergency patients in a timely manner. We have extended hours for your busy schedule. We offer sedation for those nervous about dental work. We LOVE working with kids and families. We care about giving back to the community which has always supported us. This is a key pillar of our practice.